I decided that my criticism of Tipsters wasn’t entirely fair considering that I’ve never even used a ‘Tipping Service’ myself. So I set out to find the very best Tipping Service and subscribed to it for a month. My chosen service had to meet a set of requirements before I parted with any money. The aim was to establish whether or not my opinions are unwarranted or biased, and to [hopefully] find a genuine Tipping Service that I could recommend to the readers of Punter2Pro. Update: as of September 2018, I've been adding to a list of my Top Rated Tipster Services. I’ve written about Tipsters before in my post here. I listed the dangers/flaws in sports Tipping Services, concluding that the whole concept of “tipping” somewhat trivialises how difficult it is to find long-term profits from sports betting. But I wanted to disprove my own points of view. Now, I wouldn’t have parted ways with any money whatsoever on a service that didn’t [at the very least] meet all of these requirements. To my amazement I actually found something that ticked every box, plus more. I won’t name the service I chose, but it was established in the mid-noughties. It has a very neat website and login section for subscribing members. It came with a (limited) free trial showing historic races, which I thought was a pretty nice touch. The proof of winnings section was a little vague — but it presented some convincing profit records, and branded itself as an “investment opportunity” as opposed to gambling. At £40 per month for the basic subscription package it wasn’t going to break the bank either. Even I had to admit that it looked decent. I wasn’t completely satisfied yet, though. I researched the company and their services. The selections are supposedly “proofed” by the Racing Post, which sounded impressive. I couldn’t find too many customer reviews of the Tipping service — but the reviews I did find were all positive. To tell the truth I liked the idea that reviews were hard to find, as this gave the impression that it’s profitable members wanted to keep it on the down-low. Everything so far seemed legitimate. Now for the all-important part: the concept, value and the logic behind the selections. Whilst I was looking to scrutinise this part, I found myself pleasantly surprised with how transparent this particular service appeared to be. It didn’t try to use the strike rate as a smokescreen — a strategy often employed by Tipping Services to trick naive Punters into thinking they’re subscribing to a profitable service. But any of us can bet with a good strike rate by choosing low odds. Crucially, I could tell that whoever had written the content for the website fully understood value betting and what it takes to earn long-term profits from horse racing. Why Should I Believe the Selections are Profitable? They actually explained that 75-80% of their selections contract [in price] by the SP. Whilst i was sceptical of this statistic, I reasoned that even if it were 60% it would be fantastic. Backing prices which contract (fall) by the SP consistently make long-term profits, and I’ve proved this myself (check out A Punter’s Guide To Beating The SP). How Likely Is It That I can Bet on the Selections at the “Target Odds”? They state that the (highest paying) premium members obtain early access to the selections and therefore first dibs on the odds. Prices are expected to drop off a little by the time the lower-graded members come in. However, it explains that it is still very reasonable to achieve the target odds. So this was good news, too. OK, OK… So Why isn’t this Firm Just Betting on the Selections Themselves?! This was the all important question. But they had the answer to that as well. They state that they have capitalised on their betting system themselves and consequently had all of their betting accounts closed. It’s more profitable for them to sell tips nowadays. Sure. I can just about buy into that idea. It certainly talked the talk. I decided it was worth a go. Whilst I was certainly still sceptical I maintained some level of hope: could this be a hidden gem that’s ignored by the public because everyone assumes it’s too good to be true? Odds that are so severely crushed by an influx of volume from the tipped customers that the odds fall below their fair value. In the latter case, the odds could be Layed on the betting exchange — the exact opposite of what the service encourages it’s customers to do, ironically. I signed up and deposited the £40 subscription fee to gain instant access to the chosen Tipping service. My first impression within the first few minutes of viewing the tips was this: “the target odds are too low”. It was a little concerning to discover that selections with exchange odds of 17.0 would have “target odds” of around 4.0. Whilst this would imply that the exchange was offering excellent value, I knew enough about horse racing markets to detect that this couldn’t be right. Again and again the selections were very easy to back well above the “target odds”. I can understand the occasional disagreement between one’s calculated odds and the industry price — but there was a huge discrepancy on almost every selection. These markets weren’t illiquid, either. I tried to make sense of it. I didn’t place any bets and instead requested past results from the Tipping service so that I could load it up in Excel and explore the data myself. The company were actually very helpful and sent over a spreadsheet of 365 days of tips. I began to investigate. I had to make some changes to the data. There were some rather unusual outliers at odds of 1000/1 which skewed the figures. These had to be disregarded because several of them were apparently winning bets. I’m almost certain that those odds weren’t available anywhere — and if they were then there certainly wouldn’t have been as many winners as the spreadsheet suggested! It looked freaky, so I queried it and the company confirmed that the data defaulted to a value of 1000 whenever there was a technical issue. Now that the data looked much cleaner, the next thing I did was produce a graph of the 365 days of betting. Backing all tips at the “target odds” using an equal stake of £50. Backing all 27,130 tips at the "target odds" gives a total ROI of -35.4%. Wow. I can safely say the target odds are definitely not values I would ever base my bets around. As I suspected, the supposedly smart, powerful and accurate algorithm that the Tipster’s website confidently boasts about is severely under-pricing horses. My confidence in the service had been knocked, but I hadn’t lost all hope quite yet. Recorded within the same spreadsheet were more values named “best odds”. This was intriguing, as [i thought] perhaps these odds represented values that you could easily achieve on the selections provided. 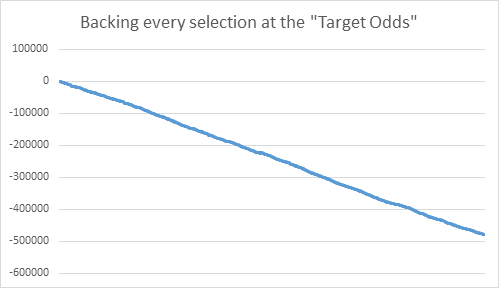 I graphed the result of using those odds instead. Backing all tips at the “best odds” using an equal stake of £50. Backing all 27,130 tips at the "best odds" gives a total ROI of +99.6%. Profit this time — but I wasn’t excited yet. Why? Well, I’m going to put this bluntly: there’s no such thing as a 99.6% ROI in sports betting. Looking at the graph I noticed there some pretty drastic vertical jumps in the total PnL. Check out those huge ones around 1/3 the way across. I needed to reduce the data set to see if I could make more sense of these results. It looked to me like there were some additional issues with the odds being recorded incorrectly. I can appreciate that occasionally data collections tools fail. My gut feeling was that the odds were recorded using the Betfair API, and that in some instances it didn’t collect a realistic average price. This could’ve been due to poor market liquidity, or outsiders with insufficient volume. The easiest way I could improve the data was to limit the odds I looked at. I hoped that this would concentrate the selections on the most popular outcomes of the race and reduce the likelihood of incorporating vastly incorrect prices. Realistically I probably wouldn’t bet at odds that were too high anyway. I decided a limit of 20.0 was suitable. The data set was reduced to 22,286 bets as a result of the odds constraint. I believe this helped to rectify the problem, as the results appeared to be more realistic. Backing all tips up to 20.0 at the “best odds” using an equal stake of £50. 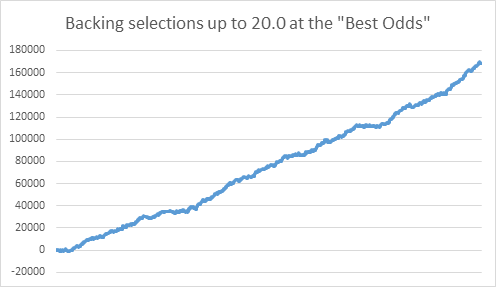 Backing all 22,386 tips (up to 20.0) at the "best odds" gives a total ROI of +15.0%. Whilst I was sceptical of 15% being achievable, I could (at least) believe that it’s possible. The “target odds” are awful. I didn’t want to be Backing anywhere near those values (unless I’m aiming to lose money). The “best odds” are great. On every bet I want to be backing as close to those values as I possibly can. So What Are These Mystical “Best Odds”? I asked the Tipping Service this question over email. 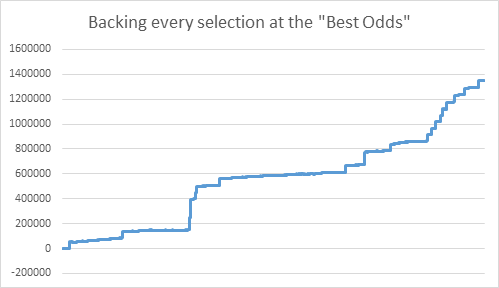 I received a quick reply stating that the “best odds” were the highest values available from any time up until the race starts. This concerned me. Punters can’t possibly detect the best odds on the lead up to a sports event. If we could, then we would all be very rich from sports betting. Nonetheless, I wanted to experience using these tips hands-on. Perhaps I was missing something. How Feasible Is It To Achieve The 15% ROI? That’s the key question I set out to answer. I just needed to know how challenging those “best odds” are to find. I knew that even if i were able to achieve close to the “best odds”, and could further verify the selections by finding that it was significantly Beating the SP, then I would be confident that I was onto something pretty special. To find out once and for all if this Tipping Service worked, I recorded approximately 500 “mock” bets into a spreadsheet to reach my final verdict. It didn’t make money. It appeared to be breaking even. But I decided not to waste any more of my time because I had already reached a conclusion on my findings. The “Best odds” are impossible to regularly obtain. You simply cannot know whether the price you back will turn out to be the best price by the time the race begins. The service misleads customers with it’s Profit/Loss records. By assuming the “best odds”, the figures aren’t representative. Customers will not be able to achieve those results. The average odds achieved do not significantly beat the SP. In my 500 “mock” bets, I averaged 101% of SP. This is to say that the odds I averaged were almost the same as those offered at SP. There’s no value in betting at these odds, and you can read more about this concept here. To make matters worse I noticed that the members area of the service includes a lot of affiliate links to Bookmakers. Of course it does — it’ll surely earn them a rake-back when their customers inevitably lose money. Last Try: Is It Possible to Lay at The “Target Odds”? I wondered about Laying at those poor “target odds”. Is there a profitable Laying strategy buried amongst the distorted numbers? Hardly any of the selections fall to values as low as the under-valued “target odds” — so there’s no opportunity for a Lay strategy. Besides, even on the rare occasions that they do fall I’d still have far more faith in the betting market than advice given from this particular Tipping Service. Therefore I conclude that it’s most definitely a waste of money. The lesson here is that stats are often misleading. Just because the odds were valuable at some point doesn’t mean you’re going to be able to obtain them and make a profit. I’m sure there’s other Tipping Services which aren’t flawed, like this one. But the question is: would you be confident in finding something better? I highly recommend reading my more recent article on the Best Sports Betting Tipsters/Tipster Services. What Does ‘Value Betting’ Mean? Good you checked everything rather than blindly betting. Crazy they’re allowed to sell it as being ‘profitable’. If they advertised it as a horse racing database or form guide then it would be fine. But they actually posted up graphs of results over a year. The results look amazing because they’ve cherry picked excellent odds which occurred throughout the day.